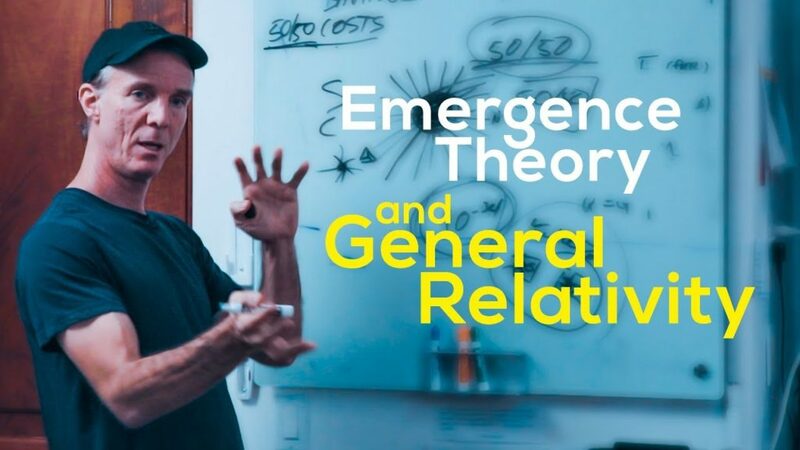 In Quantum Gravity Research‘s (QGR) video ‘Emergence Theory and General Relativity’, researcher and QGR founder Klee Irwin raises some eyebrows as he talks about Emergence Theory and some “radically different” ideas around the Quasicrystalline Spin Network (QSN). If you’ve been following our emergence theory journey, it’s been suggested that reality does not have any curved spacetime. Klee recently wrote about this in his Deep Thoughts blog. Curves are expensive computationally and the code theoretic axiom, as restricted by the Principle of Efficient Language (PEL), implies that nature doesn’t do circles… only polygons. Angles, no curves. The twist isomorphism to curvature is what the QSN toy approach is about. There is strong evidence that massive particles attract to other massive particles. And photons near a strong mass change their vectors the way general relativity predicts. Before we go onward to trit cost and savings, it’s helpful to understand what attraction is in the QSN toy model. It is a computation theoretic concept – a savings of a trit or frame. In the QSN view, when a particle accelerates under an attractive force, it is always because of a sequence of one or more trit coincidence events – a quantum of acceleration/attraction. As we know from the toy model, all four of these things are made of trits: (1) space, (2) time, (3) fermions and (4) bosons. Now, the rotation has been shown to be isomorphic to 3-space curvature, specifically, a quantum of such curvature. And ALL trits have a relation to other trits that is exactly this rotation isomorphic to curvature. With that being true and giving us some deep feel for why Einstein’s GR is so beautiful and powerful, we can still hold his isomorphic value called spatial curvature is being an isomorphic way to model what ACTUALLY happens in the geometric code that the universe uses – rotation/twist. OK, so back to this trit cost and savings thing. Mass is trit cost resulting from a fermion being out of “resonance” with its empire wave field, where “resonance” means a high degree of trit coincidence. When the trits are from attractive acceleration of the fermion, the Inertial Frame Reference (IFR) changes without inertial mass because the quasiparticle “falls” into a path of perfect positions to fulfill its sequential XYZT coordinates, where those positions are occupied to the same trits needed but that belong to other empires waves in the energy well. When the trits are from repulsive acceleration of the fermion, the IRF changes with inertial mass. When the T:P ratio of an IFR is constant but its direction changes, there will be trit cost in the form of centrifugal inertia. the loss of trit savings during deceleration quanta of the repulsive interaction with another particle’s empire field. When the spatial translation portion of the T:P ratio is reduced, trit cost is paid for by the trit savings = energy of trit savings increase. When the T:P ratio of an IFR changes, there will be trit cost in the form of the inertial mass. Time and space translation are reduced when fermion trit cost occurs. Each fermion has its own ratio of T:P irrespective of the direction of universal time = the action horizon relationship to the quasiparticle. The direction component of quasiparticle vectors can point in virtually any direction in the QSN. Both inertial and gravitational mass are quantized as trit costs = loss of trit savings = energy quanta. Attractive acceleration quantum = IFRs with lower probability for direction change and do not possess inertial mass statistically tend to repeat sequential instances of attractive acceleration at frame-n, frame-n=1… relative to the two empire waves being attractively linked at frame- n.
Repulsive acceleration quantum = IFRs with higher probability for direction change and to possess inertial mass statistically tend to not repeat sequential instances of attractive acceleration at frame-n, frame-n=1… relative to the two empire waves being repulsively linked at frame- n.
In other words, general relativistic “gravity” is the delta between the two statistical probabilities for direction change = lower probability for repeating instances of repulsive acceleration versus attractive acceleration quanta between empire waves in the two systems of fermion quasiparticles. With two small systems of such masses, it is difficult to measure this small delta. With two small systems, each with one or more fermions, and where each system has a high percentage of dipole aligned fermions, an exponentially high percentage of either repulsive or attractive acceleration quanta will occur, such that the same quanta of trit savings and cost may be labeled as EM attraction or repulsion. Electrons are helices of 20-groups with 5-peridocity and right-handed chirality. Photons are helical wave based coherent translating patterns of trit savings in the Phi-field of the shell ordered state selections of the QSN. Virtual photons and fermions are non-coherent instances of trit savings and cost in the Phi-field of the shell ordered state selections of the QSN. The quantum wave function is the statistical probabilities for trit savings and cost between empire waves. The quantum Phi-field is the statistical probabilities for trit savings and cost between empire waves across spacetime. Read more about PEL in Klee’s paper ‘The Code Theoretic Axiom: the Third Ontology‘ in which he suggests reality could be non-deterministic, not because it is random, but because it is a code–a finite set of irreducible symbols and syntactical rules. For more on the QSN, read ‘Toward the Unification of Physics and Number Theory’.